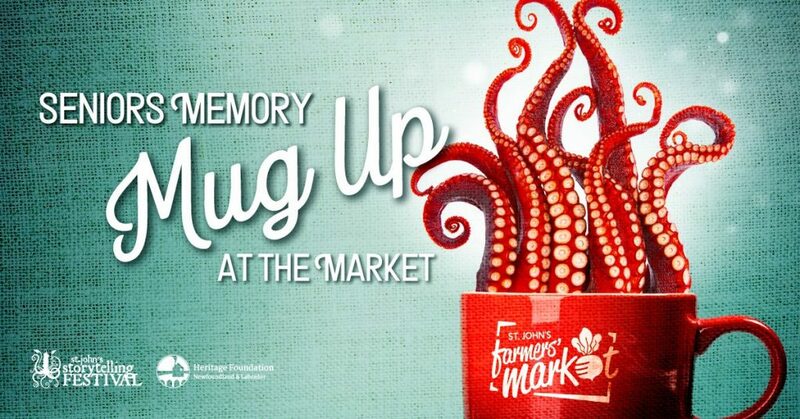 We are thrilled to be partnering with the Heritage Foundation of Newfoundland and Labrador and the St. John’s Farmer’s Market to host Senior’s Memory Mug Ups! Where: the St. John’s Farmer’s Market, 245 Freshwater Rd. What are your fondest childhood memories? Which local shop did you frequent? Do you remember the best hill for sliding? We want to know! The Seniors Memory Mug Up at The Market is a free and informal story sharing session for seniors, where people gather, have a cup of tea, and share memories. Seniors bring a memory of growing up, organizers in partnership with vendors at the St. John’s Farmers’ Market supply the tea and healthy local food, and everyone has a chat. Following the sessions, those who are interested can set up a time to have their stories recorded and archived by one of our story collectors. These stories will be edited into a booklet, which will be launched during the final storytelling session in March 2020. We’re seeking passionate, organized individuals who want to help us bring the magic of storytelling to audiences around St. John’s! We’re growing! The St. John’s Storytelling Festival is recruiting new Board Members. The St. John’s Storytelling Festival has been in existence since 2004 and has offered a highly successful Storytelling Festival for 15 years. As we continue to respond to the exciting work through our community partnerships, festival, and special events, we are looking for champions to help us realize these goals. The St. John’s Storytelling Festival is a not-for-profit organization that has been active in the Storytelling community of Newfoundland and Labrador since 2004. We host and organize an annual Storytelling festival bringing storytellers from across the Province, Canada and internationally to the stage in St. John’s. Our festival and year-round programming includes story walks, group and solo shows, open mics, workshops and working groups, and events for families and young tellers. Serving on the St. John’s Storytelling Board is an extraordinary opportunity for an individual who is passionate about the art of storytelling, and excited about leadership and governance in the nonprofit sector. The successful applicant will have time to commit to monthly board meetings, planning sessions and assisting with special events from time to time. We are seeking a team player, someone who listens well and is thoughtful in considering new ideas. A positive, collaborative attitude is essential to ensure the continued positive success of the organization. We would be delighted to hear from you. Please email your completed application to storytellingstjohns@gmail.com We require the Personal Information Sheet (below) and a recent CV.